Lizzy’s been outside nearly all day. I wanted to take a few photo’s tonight and called for her. She didn’t want to come in the house, instead she posed for me outside the kitchen window. She’s full of energy and smiles. Note to self –> wash windows! Note to you –> that ugly blue fabric is NOT my kitchen curtains, it’s the edge of the umbrella on my deck. I get tons of questions by email and in the comments. I try to answer as many as I can. I thought I’d try answering some of them in the actual posts. (Cindi Hoppes) Why donâ€™t you ship me some of your laundry?! Why thank you Cindi. You’re such a lovely lady. I could if you really want me to. Do you promise to separate the darks from the whites? 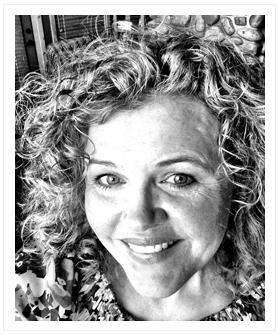 (Glittersmama) So are you a lefty too? No, I am not a lefty. I am a right handed and do everything right handed. Unlike most of my family who are a mixture of both. My dad is right handed and plays hockey and golf left handed. My brother is left handed and plays sports right handed. I am sure you get the point! I won’t go on and on and on … because I know (mommyknows) that you don’t want to know about 3rd cousin Bob and his ambidexterity, right? (j4wmkc) Oh.. and does a $15 Gift card spend the same here as there or can we in the US get more for our money here â€“ arenâ€™t people coming here to spend like crazy … This is actually two questions, but what the hell … can’t say that I am cheap with answers! I plan to give the winner a card in the currency of their choice. Yes, Canadians are spending lots of money in the US right now. Because our $ is strong, it goes further in the USA than at home. (Evanstox) Is it too late to be entered in the contest???? I am sorry Evanstox, I am afraid that you missed the Bumkins Diaper Bag Giveaway. Don’t be too disappointed, there’s always the next contest! (Michelle) I didnâ€™t take a single photo, but wasnâ€™t it awesome?! Yes, it was pretty awesome. Our older kids enjoyed it a lot. I just wish I had a better lense so I could have taken better pictures of the moon — > like this one. If you have one of those ‘need to know’ questions. Go ahead and ask it. I might just answer the ‘last 5 questions’ again tomorrow. This is a truly remarkable and innovative diapering product that www.thebabymarketplace.com is excited to be able to offer to our customers! The bumGenius One-Size Cloth Diaper is revolutionary in design – it is the first reusable diaper to feature stretch-to-fit tabs (patent pending) that make cloth diapering as easy and comfortable as using disposables. * A laminated polyester exterior with a soft, cloth-like feel that is waterproof, durable and can be washed in hot water. * Double-crossover tabs for added convenience and durability. * A unique â€œinsert stopperâ€ topstitch that helps keep clothes dry. Simplify your life and save money too! 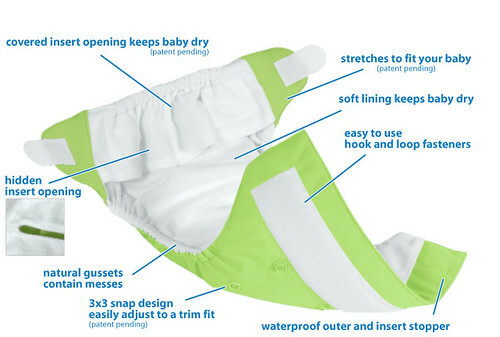 The bumGenius One-Size Cloth Diaper fits babies from 8 to 35 pounds. Three rows of three snap-downs on the front of the diaper (patent pending) will adjust the rise of the diaper as your baby grows. Every bumGenius One-Size Cloth Diaper includes the highly acclaimed Cotton Babies Microfiber Insert. There will be two winners – each winner will receive a bumGenius 3.0 One-Size Cloth Diaper. The 1st Winner will be chosen randomly from all new comments posted on all posts between February 24th, 2007 and February 27th, 2008 (@ 9:59 pm MT). The 2nd Winner will be chosen randomly from all the bloggers that post about this contest on their websites (make sure to come back leave a link in the comments section, so I know who you are) between between February 24th, 2007 and February 27th, 2008 (@ 9:59 pm MT). MommyKnows and www.thebabymarketplace.com (a great place to shop and learn about cloth diapers) are hosting the bumGenius 3.0 One-Size Cloth Diaper Give Away.Go on over and comment and be entered to Win one of two bumGenius 3.0 One-Size Cloth Diapers. You may enter the ‘bumGenius 3.0 One-Size Cloth Diaper Giveaway’ by commenting on ANY or ALL posts between February 24th, 2007 and February 27th, 2008 (@ 9:59 pm MT). I ordered some BumGenius before my son was born. They are definitely my favorite diapers! I love the name too. Oh wow, I have been looking into Bumgenius 3.0. We’re still doing disposables, but I think I’m ready to take the plunge! My plan is to get one and see how it goes. Any tips? I’d love to win my first one! Never thought I’d get so excited over a stretch tab, but I am! We’ve been using DryBees and Bumkins (which I love!). If I don’t win, I will just have to buy one. Her personality sings in that image! Beauty. What is your favorite cloth diaper to use? or that you have used in the past? That’s such a cute picture! I’m really intrigued by these “one size” cloth diapers. I’ve cloth diapered my son for almost 2 years now and have gone through a few sizes/styles in that time…the one size, all in ones seem remarkably all inclusive. :) Have you used them? Have you or any of your customers complained of bulkiness on babies (like at the newborn stage)? It’s good to know so much about your family dexterity! Oh, and I love cloth diapers! Your Girls are beautiful. Oh, so is Sam. I love that expression – she’s up to something! Absolutely beautiful :O) I would love to win the diaper.. count me in! Did you cloth diaper all of your kids? I wish I enjoyed outside in the winter like that. I make sure the 3 year old (niece) gets out some in the winter but she has been too sick to get out much. I used to love winter. I loved skiing but haven’t been in a very long time. I do like the BumGenius one-size I have. I have version 2.0. It did great on my daughter as a newborn (not too bulky) and still fits with room to grow at 14 months. I may have missed the questions but – do you use a filter or cover of somesort on your lense? (Forgive me, camera ignorant) A of your pictures have a hue to them, it looks cool. I feel like that too, sometimes! 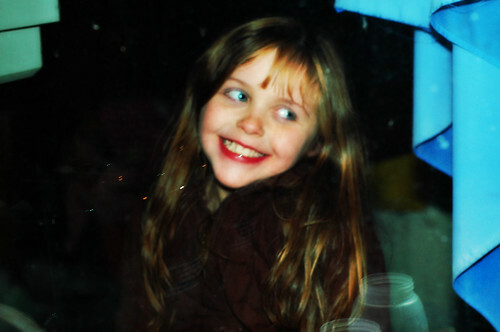 Your daughter is absolutely beautiful. Your diaper giveaway has me excited to dry CD’ing! The weather has been warm here in Texas, we haven’t had anything relating to winter. those diapers are so cool! Next post: There’s No Pleasing Some People!